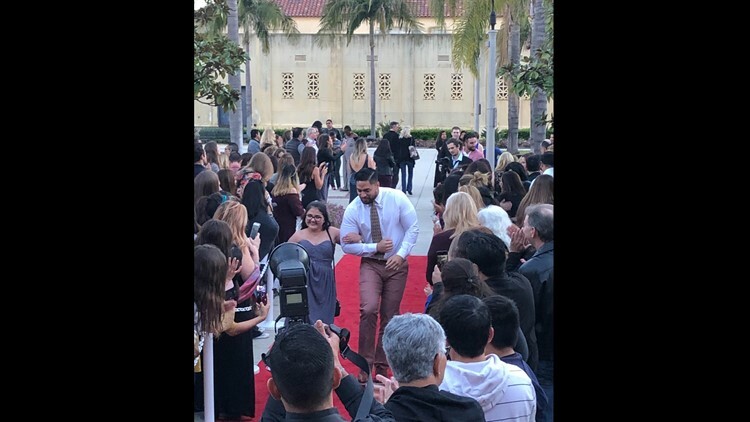 SAN DIEGO — Liberty Station rolled out the red-carpet Friday night for the Friends of Scott Foundation’s 13th annual Unforgettable Prom for teens with cancer. The foundation’s signature event treated over 200 San Diego teens, who are pediatric cancer patients, to an evening of prom-filled excitement. Some teens were even escorted on the red-carpet by former Charger Manti Te’o. “I know what it is like. I did not get to make it to my own prom at school, so I thought this would be a good opportunity, said 18-year-old Mason Tone. This year’s prom was 17-year-old Hellen Antonio’s first prom. “Last year I was going to go, but I could not make it because I was in a coma,” she said. While she might have missed last year’s prom, this year Hellen was crowned prom queen. “This brought me back to life,” she said. Alongside Hellen was prom king, Mason Tone. “Everything that he has been through helps me to go and keep pushing. He is my hero,” said Mason’s mother, Makia Walker. This year’s prom honored Ryan Wilcox who was named Prom King at the 2016 Unforgettable Prom and lost his battle with cancer shortly after. Limo service for those attending was also provided thanks to the event’s sponsor Batta Fulkerson Law Firm. “Many children with cancer have not have been able to partake in the tradition of school dances due to their illness, and we are committed to providing pediatric cancer patients and their families with a prom of their own and the opportunity to create cherished memories,” said Carmen Delgadillo, Founder and President of the Friends of Scott Foundation. Friends of Scott is a non-profit organization that was founded in 2003 in memory of Scott Delgadillo who lost his life to childhood cancer. Its mission is to help children with cancer and their families through financial, emotional and programming support. Donations to help fund this year’s event are still being accepted through a Friends of Scott GoFundMe page.